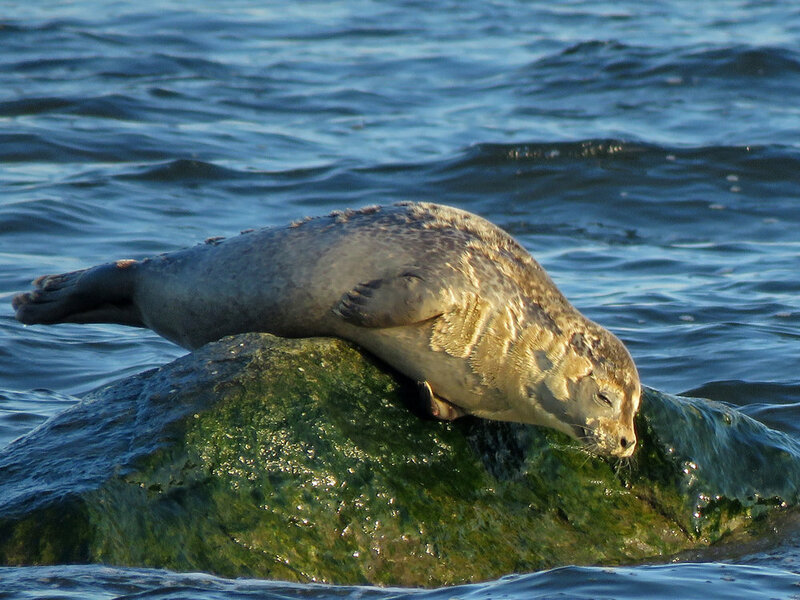 Harbor seals (Phoca vitulina) spend half their time in the sea and half on land. 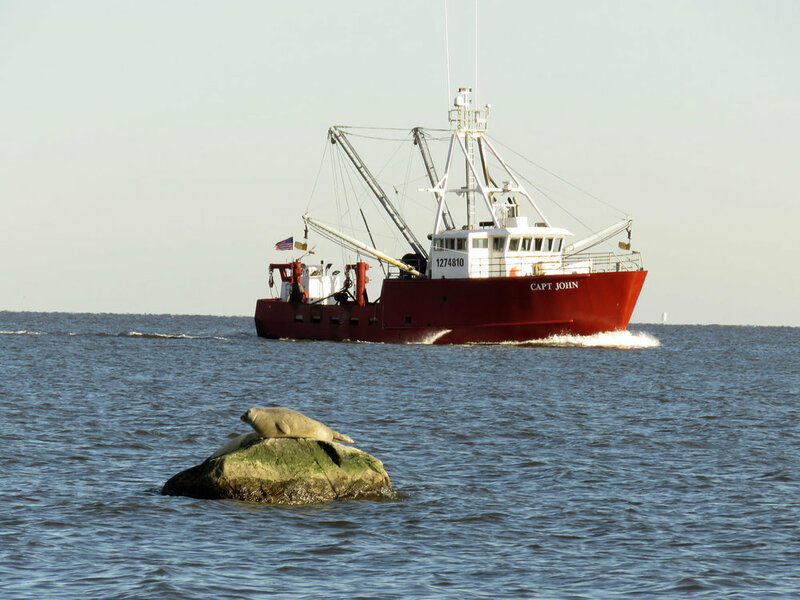 They "haul out" onto rocks to rest during the day, and that is what I have had the opportunity to see them do off the shores at Staten Island and Queens. 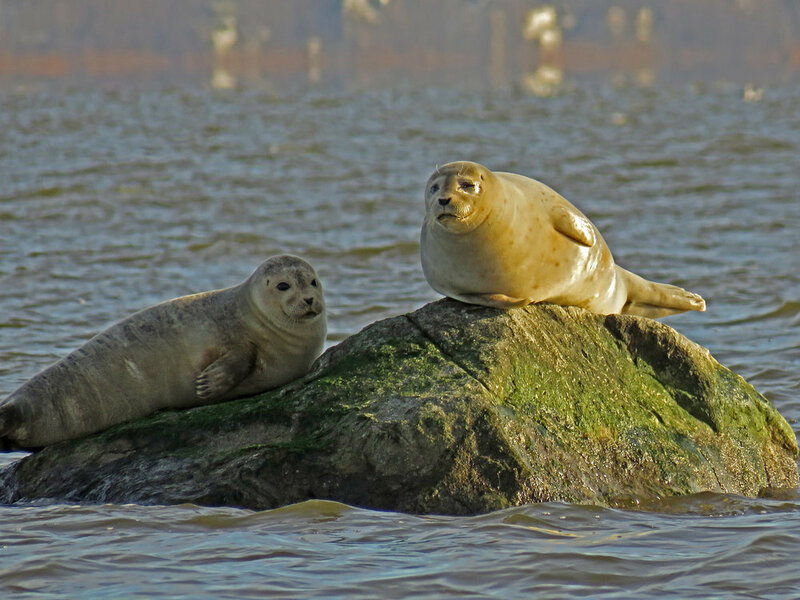 I have taken two cruises on the American Princess with Gotham Whale to see the seals on the rocks near Swinburne Island, near Staten Island. These photos are from the trip I took on April 6, 2019. 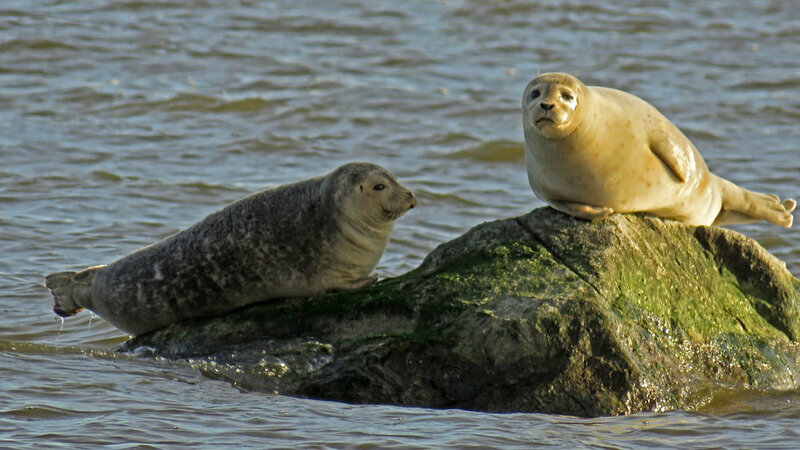 Also present was a lone gray seal, and since I haven’t yet created a gray seal page, here are some photos. This is not the Loch Ness Monster! 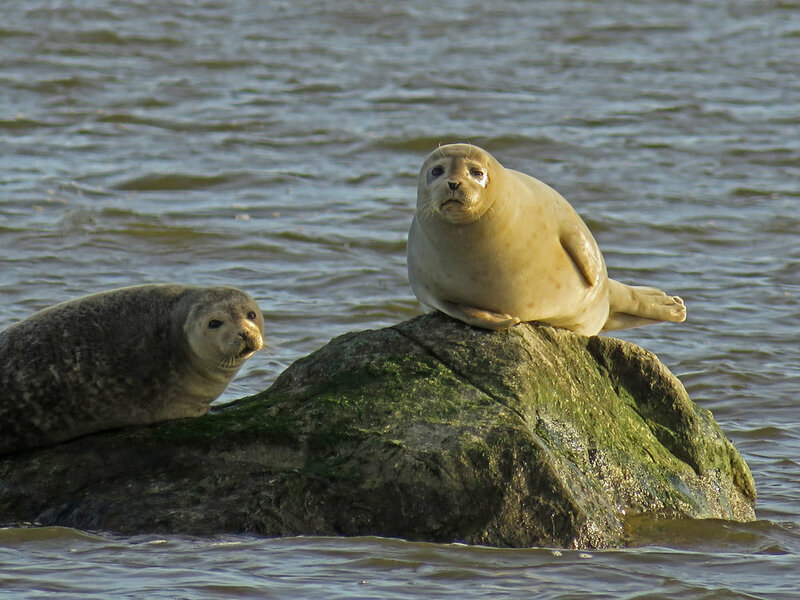 When I visited the beach at Mount Loretto Unique Area on March 26, 2019, I got to see three seals on a rock as they were joined by a fourth seal. Apparently that was all those seals thought the rock could hold, because when a fifth seal tried to join them, the seal was rejected and circled the rock trying to join them. There are photos and a video! 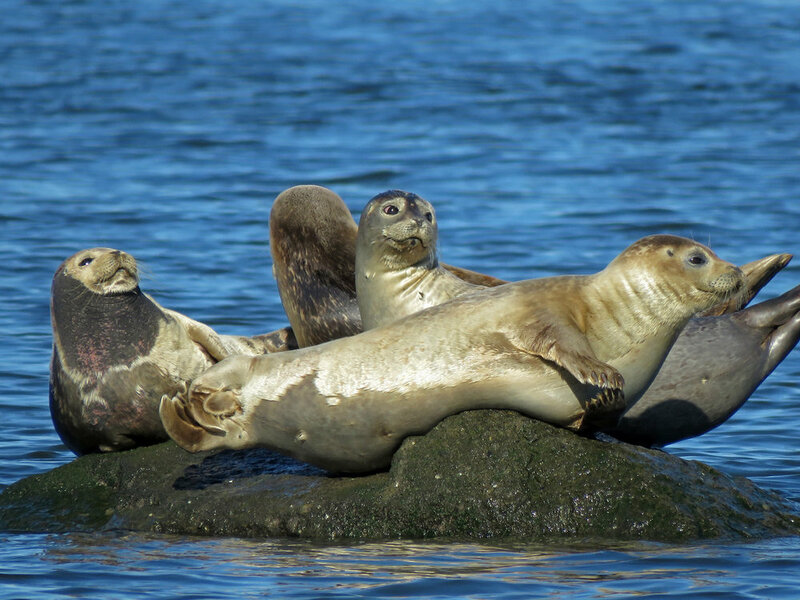 Four harbor seals were sharing a rock near Mt. Loretto Unique Area on Staten Island on March 26, 2019. 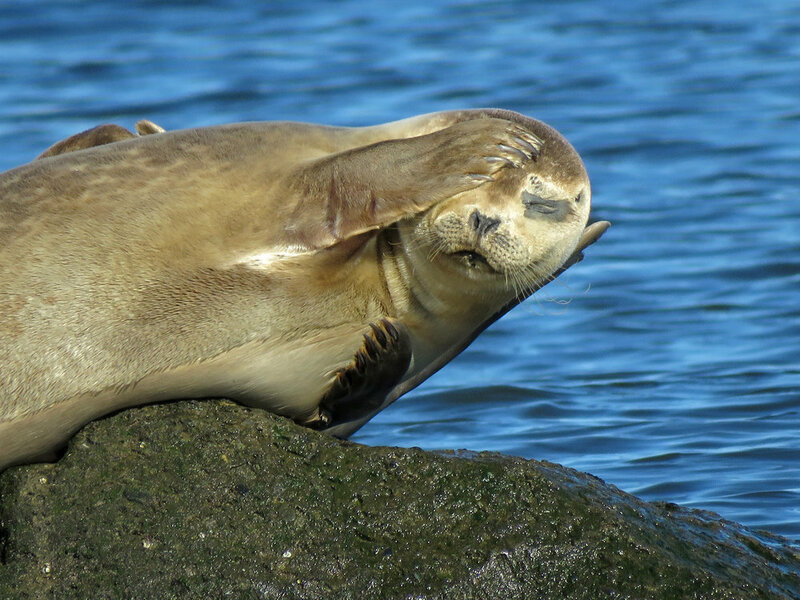 A fifth seal tried to get on the rock, but was thwarted in several attempts. 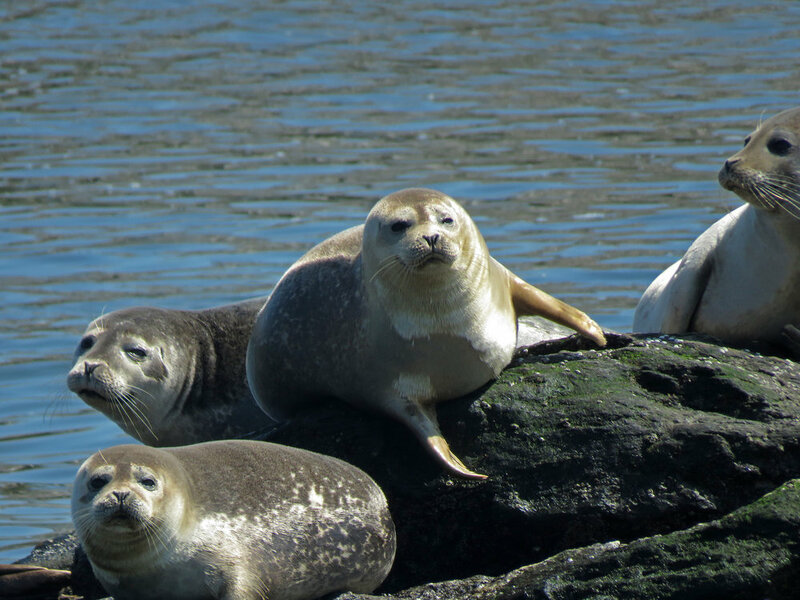 This video was filmed on March 26, 2019, and lets you see the delightful antics of the harbor seals while listening to Bach. This slide show is from March 26, 2019, off the beach on Staten Island. 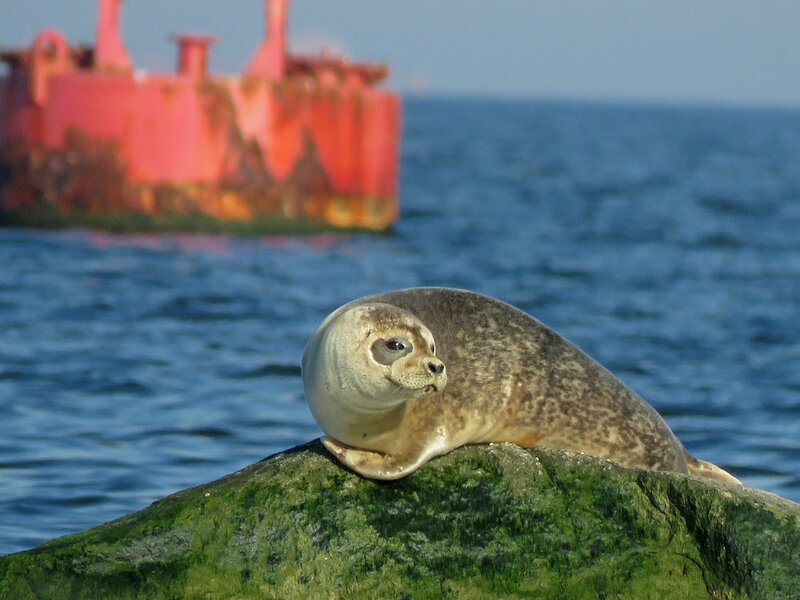 I spent an afternoon with a harbor seal off the beach of Mount Loretto Unique Area on Staten Island on March 9, 2019. The seal inspired a video set to music by Mozart, and lots and lots of photos. This video was shot on December 9, 2018, when I saw three during my walk on the beach. I included it in the Christmas in New York 2018 series, because they made me so jolly! 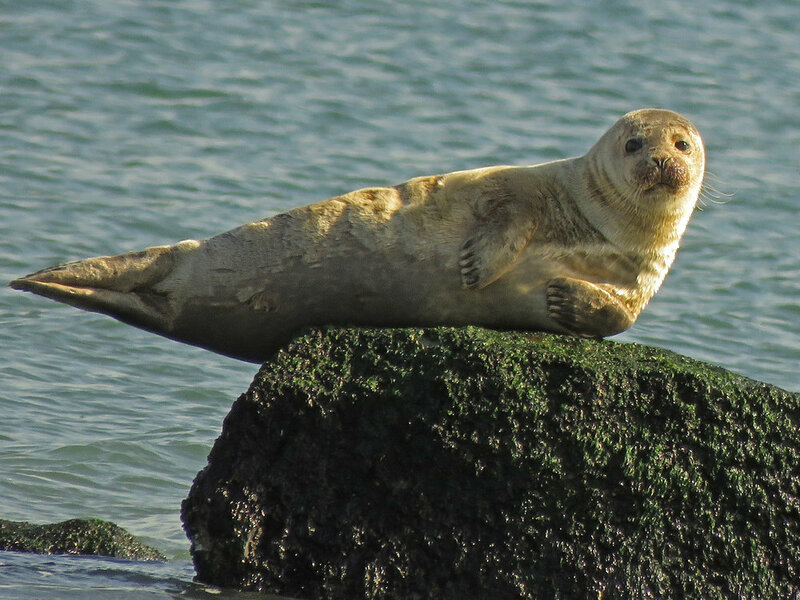 I had the opportunity to see seals on November 18, 2017, and January 31, 2018, off the beach at Mount Loretto Unique Area in Staten Island. 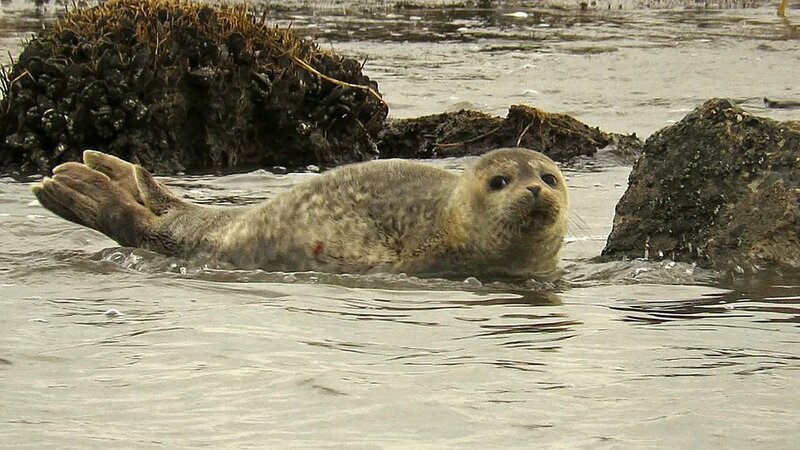 I saw more seals on February 6 and 15. There are two videos, which are very relaxing to watch! These magnificent marine mammals are one of many reasons to work hard to clean up our oceans and to fight the deadly climate change we face on our planet. 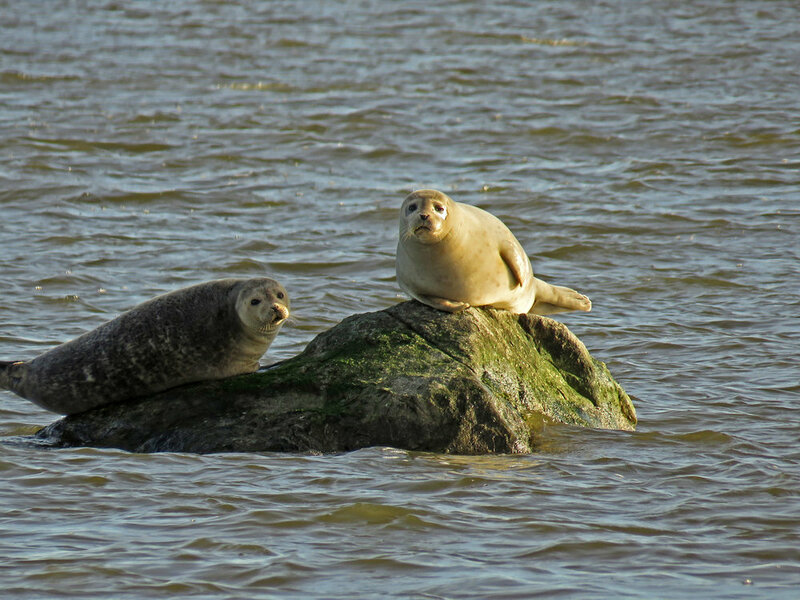 To honor these seals, I've put together a video set to music by Borodin and Johan Strauss II. 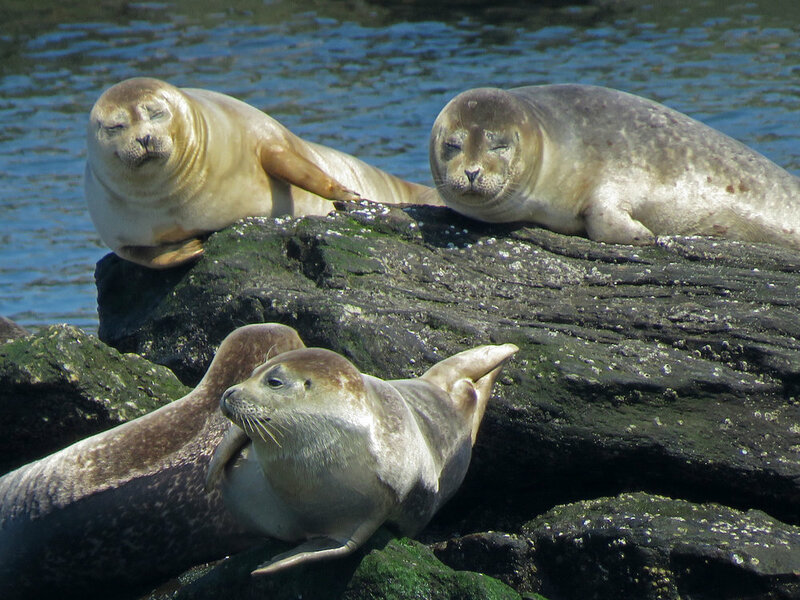 These harbor seals are shown "hauling out," but they can sleep underwater for up to two hours. They eat fish, shellfish and crustaceans. They are protected under the Marine Mammal Protection Act of 1972, but there are so many threats to them in the wild. These first shots are from Mount Loretto Unique Area, Staten Island, February 15, 2018. These shots are from November 18, 2017. These photos are from January 31, 2018. 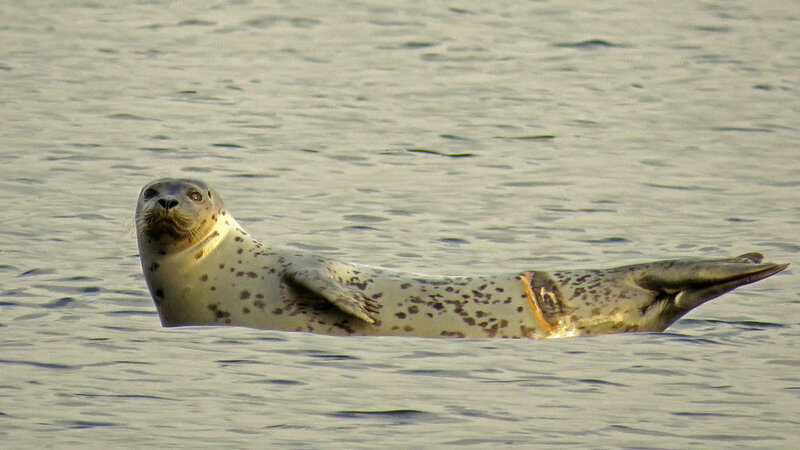 The harbor seals are so expressive, and were as aware of me as I was of them. I spent about 45 minutes watching them from a rock. At one point I looked down to change a camera setting. When I looked up, the rock was bare and I couldn't find them again.